We’ve all heard the story of Noah’s flood. How everyone mocked the man and called him crazy because he was building an ark so big, that it would house two of every unclean animals and seven of even clean. I know a lot of people miss that, but that is exactly what Noah brought into the ark. 2Of every CLEAN beast thou shalt take to thee by SEVENS, the male and his female: and of beasts that are NOT CLEAN by TWO, the male and his female. Which by the way is an allegory for those with ears to hear. TWO = Duality, a double minded man is unstable in all his ways. Now the SEVEN clean animals, SEVEN is the number of completion. These animals all represent natures inside of mankind. Oh I know, many will say, no, they were LITERAL animals and have NOTHING to do with NATURES in MAN. But you’ll soon see, that scripture is an allegory, and ANIMALS represent natures in man, that God has to deal with. For example have you ever said, “He’s stubborn as a mule”, or “That person is a work horse!”? Let’s look at what scripture says about the animalistic nature of man. I also thought, “AS FOR MEN, God tests them so that they may see that they are like the ANIMALS. 19 Man’s fate is like that of the animals; the same fate awaits them both: As one dies, so dies the other. All have the same breath ; MAN HAS NO ADVANTAGE OVER THE ANIMAL. Now a quick side note as to what and who these “Men” are that we just read about. The men are WHO WE THINK WE ARE, not who we really are. The “MEN” are simply an allegory of the EGO of us all. It is on “evil/foolishness” continually, and within this EGO there is no good thing, but every wicked thing… This is how scripture paints the picture of the ego. But back to my point, scripture is written in a very poetic style. ART, ever since man began to try to declare the higher things of life, has always been used to describe the indescribable. Which is why Jesus states, the Kingdom of Heaven is a MYSTERY and that to those who do not understand this mystery ALL THINGS ARE EXPLAINED IN PARABLE. The story of the Flood is no different. So these animals and creeping things that Noah brought into the arc to save, is actually symbolic of the ideas and natures we pick up from the world and from those around us and allow them to take residence in our heart. Which is why we see the ego of mankind compared to animals, time and time again. “The days are coming,” declares the LORD, “when I will plant the house of Israel and the house of Judah with the offspring of men and of ANIMALS. “Son of man, this is what the Sovereign LORD says: Call out to every kind of bird and all the wild animals: ‘Assemble and come together from all around to the sacrifice I am preparing for you, the great sacrifice on the mountains of Israel. There you will eat flesh and drink blood. The Son of Man is not Tarzan, calling out to the animals. Many human beings caught up and ruled by their EGO are animals nothing more, beasts, and many of these NATURES in man God wants killed off. These are the UNCLEAN NATURES, like greed, pride, hate, lust, etc. etc… These UNCLEAN natures in man, are represented by the many unclean animals that Noah brought on the ARC two by two. I know you have been presented with the romantic telling of the story, where the animals came in as male and female mates… but as I presented earlier, the UNCLEAN animals were brought in by twos, and the CLEAN animals brought in by sevens. Consider the many instances where we see animals in the great stories of scripture. Why do you believe this is? We even have sayings like, “don’t let the foxes spoil the vine”. In scripture these “foxes” and other animals have a very profound meaning, when the keys of the allegory in scripture are opened up to you. Why is it that we see Daniel trapped with a bunch of Lions, why is it that we see Samson, David and others battling and destroying Lions or Bears? It is because they represent the natures in man that are hardest to destroy. The Devil, which is the title of man’s carnal mind, which is the “father of all lies” is described as a LION. This is the LION’S DEN Daniel was thrown in. The Lion’s den we are all thrown in. Get it? There are other natures in man represented by clean animals, like endurance, love, devotion, etc, that God will not destroy. This is what it means, for ADAM to name all the animals. Adam which means MANKIND AS A WHOLE must recognize the natures within “him”, within the Garden (GOD’S TEMPLE). So what was this ARK that was built? Some people will argue that this is a literal ark that Noah built, however, I am not going to be one to make that ridiculous argument. Look people, just because something is written in the bible doesn’t make it literally true. Especially since God only speaks in allegory and opens his mouth in dark saying. I (God) will open my mouth in a parable: I will utter dark sayings of old. Let’s put aside the fact that are literally billions of species on land, and that it would be impossible to house every creature. Let’s put aside the fact that “supposedly” Noah lived in a land where it NEVER RAINED, which would mean there wouldn’t be much water for people to drink in their life time, would there? Let’s also put aside the fact that this so-called enormous vessel was built but by an old man and some family members that helped, with only the tools available in that day. Logic alone, states you would have to be a very gullible to believe such a tale. But that is what religion does, it brainwashes the common sense right out of you. Now I’m not saying that there wasn’t some kind of an ark, or some kind of a flood. You see none of that really matters. I am saying the way people are “literally” taught scripture today is foolish at best. We don’t grow spiritually by believing that this story, or any story in scripture is literal. We ONLY grow by understanding what the STORY MEANS. This is why God only opens his mouth in allegory, why Jesus only spoke to the masses in parable. The truth is we learn better by understanding the moral of a story, than by believing the story is literal or not. 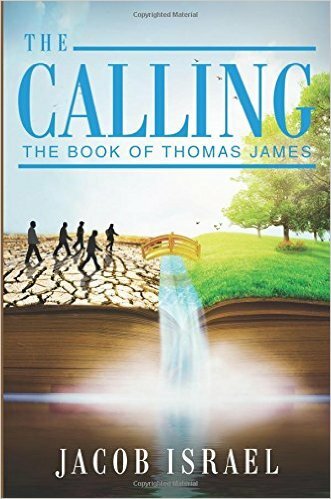 My novel, “The Calling”, could easily be taken as a thrilling story that literally happened, but it is a fiction, an allegory and if people were to focus on whether the story is literal or not, they would never learn the true message of liberation and redemption hidden just beneath the ink on the paper. I often bring up the story of the boy who cried wolf. This story we tell our children teaches a person should not lie, because there might be devastating consequences if you do. But does it matter if there was a literal boy, or wolf? Does it matter? NO! It doesn’t matter whether the story literally happened or not, what matters is what is at the heart of the story. You see allegory, parables, or make-believe, whatever you want to call it is a great teaching tool. Which is why God told many of his prophets to use allegory to teach. Son of man, set forth an allegory and tell the house of Israel a parable. Jesus only spoke in parable to the masses. And for those who do not know what a parable is by now, once again it’s a STORY, not a true story, but an allegorical tale that teaches a spiritual message. Usually Jesus began his parable off with, “there was a certain man”, meaning this is a representation of EVERY MAN AND WOMAN. Now I know this may come as a surprise to many of you but the truth of the matter is, many of the stories in the Old Testament are allegories and nothing more. Don’t believe me? Take a look at what Paul said about the “rock” Moses broke to get water. You remember the story. Israel needed to drink water, God said first strike the Rock and water came gushing out. Then God said, simply speak to the Rock for water, but Moses refused to believe, so he did what he did before to get the same result, but because he refused to move into the deeper revelation of what God was teaching him, he wasn’t allowed to bring the people into the land of promise. Many people are still striking the Rock, as opposed to speaking to it. They won’t move into the greater understanding that there isn’t anything they have to do, to have the WATER (word of God) this rock provides. Now many people believe this to be a literal story, but look at what Paul says. He goes so far as to say, there was no literal Rock at all, that the Rock is a symbol of Christ. Take a look at the next line of scripture. Now I want to point out two things here. 1) The Rock is CHRIST – 2) The ROCK FOLLOWED THEM! Now I don’t know what you believe, but here on planet earth, literal rocks don’t follow anyone… So our eyes are opened to the truth, that this whole story in the Old Testament is an ALLEGORY. But that ALSO DOESN’T MEAN that there wasn’t a literal rock that he smote. The point is we shouldn’t get hung up on the LETTER (literal interpretation) of things, which brings death. We need to SEE the spirit of the text. We see even in the story of Isaac (child of promise) and Ishmael (child of works and unbelief), Hagar (The slave) and Sarah (the Bride) and Abraham was also, according to PAUL an ALLEGORY. Now once again, I am not stating these things didn’t literally happen, but I am trying to point out that IT DOESN’T MATTER whether it happened or not. We have to WAKE UP TO THIS or we will continue to STRIKE THE ROCK to get the Water and never enter into the full revelation of CHRIST IN US, AS US. So, is this going to be an essay that is going to basically try to prove there was no flood, and that there was no Ark, and no billions of animals and creatures on that ark… YES and NO! 🙂 You can believe what you want to believe, and I know all things are possible with God, but I want you to take your eyes off the LETTER (literal interpretation) and see the SPIRIT. It is the SPIRIT of the STORY that GIVES LIFE. This paper is going to show you WHAT THE STORY MEANS! The revelation of a thing is what matters to me. Not whether something is literally true, or happened, or not. That doesn’t better me as a child of God. It doesn’t further my spiritual walk. Just blindly believing in something because some one says it true, doesn’t make it true. Just because something is written, doesn’t make it true. You’ve heard the expression, “well it’s on the internet, so it must be true.” Well just as I would say you shouldn’t trust everyone who tells you what is what, I would also say, DON’T TRUST THE WORDS I WRITE TOO. For all I know I could be completely wrong, but if I be wrong it is because God hasn’t yet allowed me to see right. You see, you MUST NEVER trust the words of MAN, but you must TESTS THE SPIRITS (WORDS) to see if they be of God or not. Do these words BRING LIFE as the SPIRIT OF CHRIST does, or do these words HINDER AND BURDEN YOU? Now of course, I don’t believe what I am writing is false or I wouldn’t write it. But the point is, I don’t want anyone to just take what I write as the “word”. I want you to seek God to see whether these things are true or not. God IN you, is ALL THAT MATTERS, God IN YOU is the ONLY ONE WITH TRUTH. And when you grab hold of that understanding, you will stop relying on your understanding and effort and you will wait for God to reveal the “thing” to you. And when you understand that ONLY WITHIN will you ever find salvation, you will be as NOAH, and BUILD THE ARK and GO WITHIN to escape the CARES OF THIS WORLD. SO LET’S ROCK AND ROLL WITH NOAH NOW! So iS God looking at the LITERAL EARTH? I think not, the LITERAL EARTH cannot become CORRUPT. only mankind’s understanding can become CORRUPT. So we must SEE that the EARTH written about here, refers to those that don’t know the TRUTH OF GOD. But don’t take my words for it, go to see if there is a witness in scripture of this. And when you do, you will find plenty of evidence in scripture that the EARTH is symbolic of MAN’S WAYS, and HEAVEN symbolic of GOD’S WAYS. So the EARTH, was actually the UNBELIEVING CARNAL NATURE AND THOUGHTS OF MAN. And we see that FLESH (the carnal thoughts of man) corrupt GODS WAY (his Truth) in MANKIND’S THOUGHTS (THE EARTH). We aren’t talking about LITERAL FLESH on your body, not your SKIN. But the CARNAL MIND which is death. 5For they that are after the flesh do mind the things of the flesh; but they that are after the Spirit the things of the Spirit. 6For to be carnally minded is death; but to be spiritually minded is life and peace. FLESH = CARNAL THINKING = DEATH — And this is what GOD is out to destroy. Not literal HUMAN BEINGS, but the CARNAL NATURE OF HUMAN BEINGS, so they can re-member they are CHILDREN OF GOD. Here God, WHO IS SPIRIT AND TRUTH, has said he is going to DESTROY THE CARNAL MIND and MAN’S IGNORANT THOUGHTS. This has very little to do with a LITERAL DESTRUCTION OF ALL OF MANKIND. It has more to do with God repenting of what Man had become, and destroying that IGNORANT first state of man, to make way for the SECOND MAN which is CHRIST. THE LAND that had no RAIN (Rain = GOD’S SPIRIT POURED OUT ON ALL FLESH) was about to be WOKE UP, by an ABUNDANCE OF GOD’S TRUTH. Now for those who have ears to hear it…. God repented he made man the way he did. Have you ever wished you didn’t become the man or woman you became? Have you ever wanted a different life? Have you ever wanted change? Have you ever hated your life and wanted it saved? Have you ever said, “I hate who I have become, I wish I could do it all over again.” — Well if you have, if you have ears to hear it, this is GOD doing the same thing WITHIN YOU. This is the beginning of a great change in your life. A FLOOD is going to destroy all FLESH (your carnal thoughts) and only the TRUE NATURE of Christ will remain. And this can only happen because, you LIKE NOAH, had to GO WITHIN the ARK (yourself = the kingdom is within). And by going WITHIN the ARK (KINGDOM OF GOD/TEMPLE) you are saved because of it. By the way, that word ARK, is the same word used for the ARK of the covenant (which holds the spirit of God), and the same ARK used to carry Moses into Egypt. It doesn’t mean HUGE SHIP. It means VESSEL, OR BASKET. And why did NOAH go into the ARK, within the VESSEL (temple)? – an allegory of how the only way to salvation is to go WITHIN. Noah was SIX HUNDRED years of age when he went into the ARK. Remember 6 is the number of Man. God also said to Noah, in 7 Days he will cause it to RAIN for 40 DAYS AND 40 NIGHTS. More symbolic numbers, 7 is when the creation is finished. 40 weeks is how long it typically takes for childbirth, 40 is symbolic of giving birth. We see the PREGNANCY parable in the number 40, in many places of scripture. For example, Israel in the wilderness for 40 years before entering the promise Land (Christ). David had to turn 40 before he became KING(Christ). Jesus was tempted and tested for 40 days and nights, before his ministry began (CHRIST) – So we see that 40 days of RAIN, is truly symbolic of the TIME OF TESTING that is poured out on humanity to bring them to their end (the end of our their carnal nature). 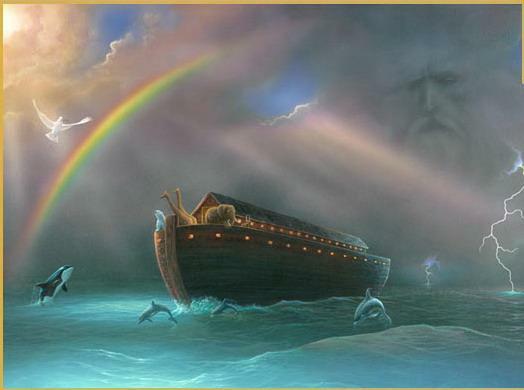 During this time of TESTING, NOAH (WHICH symbolizes mankind entering GOD’S REST, as Noah in hebrew means “REST”) ENTER THE ARK, he goes WITHIN to be saved from the FLOOD that has come upon the earth. Now this FLOOD is meant to purify the earth, a time of testing, which you will see happens to each of us. Look at the many other scriptures that speak of God delivering his people from the FLOOD on the EARTH (man’s thinking/ways). 2I sink in deep mire, where there is no standing: I am come into deep waters, where the FLOODS overflow me. We see here, the FLOOD, is actually a symbol of people coming against us, our enemies, and mainly the flood is our FOOLISHNESS… In the psalms we also learn that THE THOUGHT OF FOOLISHNESS IS SIN. Here again the Flood we see, are the LIES poured out by the SERPENT (father of all lies) – The FLOOD is depicting as a FLOOD OF LIES and SIN (FOOLISH THINKING) – Which we can be carried away by, and many times are, so long as we are in the EARTH (CARNAL SOULISH MAN’S THINKING AND WAYS). But we can be free from the FLOOD, if we GO WITHIN and seek GOD AND THE TRUTH OF WHO WE ARE IN HIM. Here we are presented with yet another wonderful allegory. Instead of an ARK being BUILT we see here a HOUSE is BUILT upon the FOUNDATION of TRUTH, which cannot be hurt or touched by the FLOOD OF LIES AND CARES OF THIS WORLD. These are but a few FLOOD PASSAGES. What I am trying to illustrate with them, is that the same EXACT same thing that happened in NOAH’S DAY, happens in OUR DAY. It is the DAY OF THE LORD. 37As it was in the days of Noah, so it will be at the coming of the Son of Man. 38For in the days before the flood, people were eating and drinking, marrying and giving in marriage, up to the day Noah entered the ark; 39and they knew nothing about what would happen until the flood came and took them all away. That is how it will be at the coming of the Son of Man. You see the FLOOD will always PROCEED the coming of the SON OF MAN. The allegory of the Flood is meant to illustrate to us, that once we go WITHIN and SEEK THE KINGDOM OF GOD, that we will RISE ABOVE THE CARES OF THE WORLD, AND BE SAVED from the very flood of lies and pain that was meant to destroy us. 17And the flood was forty days upon the earth; and the waters increased, and bare up the ark, and it was lift up above the earth. When we go within, and we REST in God, and TRUST that everything is happening according to God’s plan then we will be lifted up above the FLOOD (THE CARES OF THE WORLD, AND THE PROBLEMS that have plagued us). We will see that every horrible thing that is happening in the world today is happening so people will finally LET GO AND LET GOD take over. THE FLOOD of horrors in the earth are meant to get us all to BUILD OUR ARK (our foundations beliefs and understanding of God) and go within this TEMPLE to be free and saved from it all. 23And every living substance was destroyed which was upon the face of the ground, both man, and cattle, and the creeping things, and the fowl of the heaven; and they were destroyed from the earth: and Noah only remained alive, and they that were with him in the ark. Notice EVERY LIVING SUBSTANCE upon the FACE of the GROUND. This is symbolic of every person who was cast down to the lowest of understanding. The carnal man’s thoughts and natures, will be destroyed. The ADAMIC man exists only on the GROUND, because he fell from HEAVEN (UNION WITH GOD) will be destroyed. How art thou fallen from heaven, O Lucifer, son of the morning! how art thou cut down to the ground, which didst weaken the nations! – See my article on Lucifer for better understanding about this, Lucifer is ADAM not SATAN. In any event, we learn from this story that the FLOOD OF THE CARES OF THE WORLD and all the SIN in it will do it’s purpose. It will force people to GO WITHIN, and when they do, every nature in their PERSONAL EARTH that is “on the FACE OF THE GROUND” (every nature that is ignorant and rebellious) will be destroyed from man! Then after the NEW CREATION CHRIST is birthed (after the 40 weeks of pregnancy) we will be able to come out of the place in the SPIRIT that has kept us safe and we will no longer allow the world to trouble us. We will send out PEACE into the world (symbolized by Noah releasing the Dove). When we come out, the WATERS that once plagued us will recede and we can and will plant a GARDEN in the EARTH (MAN’S WAYS). Then and only then, will the HEAVENS AND THE EARTH become ONE AGAIN. The truth of God and Man’s thoughts will no longer be separate. The EARTH (our ways) no longer void of understanding, but filled with the TRUTH OF GOD. So much so, we will get DRUNK ON THE FRUIT of it. Now here is one last REALLY COOL hidden treat for you. 7 = once again means completion AND rest. And if you ever wondered why it was the MOUNTAINS OF ARARAT that the ARC rested on… CHECK THIS OUT! It is first because the MOUNTAIN always symbolizes GOD, a higher place of understanding… and the best part is the word ARARAT in HEBREW means = “the curse reversed” — Now isn’t that something? 21And the LORD smelled a sweet savour; and the LORD said in his heart, I will not again curse the ground any more for man’s sake; for the imagination of man’s heart is evil from his youth; neither will I again smite any more every thing living, as I have done. Of course, the RAIN WATER is the WORD of TRUTH, which rains down, from within…. We learned earlier that HEAVEN is the WAY of TRUTH… “As the heavens are above the earth, so are “my” ways above carnal man’s”. We also know that the KINGDOM OF HEAVEN is within, this is where it RAINS from… HEAVEN of course being, the highest wisdom and place of understanding which leads to peace, power, and righteousness. That being said, the RAIN (Truth) pours down from the CLOUDS above, which are in HEAVEN. The CLOUDS, which are an allegory of those who are WITNESSES or MESSENGERS of the truth. That being said, the ALLEGORY of Noah, begins by telling us, Noah lived in a land where there was NO RAIN. In other words, it means there was NO TRUTH. And we also see the alllegory of what CLOUDS with NO RAIN ARE… They are false prophets, false teachers. Whoso boasteth himself of a false gift/false miracles are like clouds and wind without rain. 2 For he hath founded it upon the seas, and ESTABLISHED it(fullness of truth) upon the FLOODS. It is the FLOOD that in the end helps us all FIND THE REST within and allows us to begin again in paradise. I hope you enjoyed this essay and that it provoked a flood of your own, that can set you free from the struggle and pain of ignorance. It is the FLOOD of TRUTH that sets us free and destroys every nature that is unclean within us, while preserving the natures that matter most of all. Next Article Reprobate Mind and Homosexuality? This word is Beautiful Thank-you Father!! I am overwhelmed by it…the Lord is showing me Truths I did not underestand through it!! Bless You Jacob. I have been struggling with some things ..I have been hearing the Father tell me that it is in His hands and He will deal with it,It is all for a purpose, I need to enter the Arc! it was 50 cubits wide. 50 stands for (the work of) the holy spirit. Diane, as I am with your comment! Thank you so much, God bless and keep you. Enlightening and Uplifting. Thanks for sharing this. Jacob this is such a eyes opening essay God has been open my eyes to see that everything that comes from Him is always to the Christ in me and His living word in my heart is going to come alive in my life. What a wonderful Father we have. everything is in spirit then mind then body in that order. in this metaphysical multiverse. the physical manifestation of the “flood” was the ice age.